You think it’s obnoxious that I just deemed one of my own recipes “best” and I don’t blame you but hear me out. I’m happy with how it tastes, sure, but it’s huevos rancheros. I didn’t invent the thing. It’s eggs with things like guacamole and corn tortillas, it was awesome before I was born. I think this might be the best-ever approach because they’re baked. 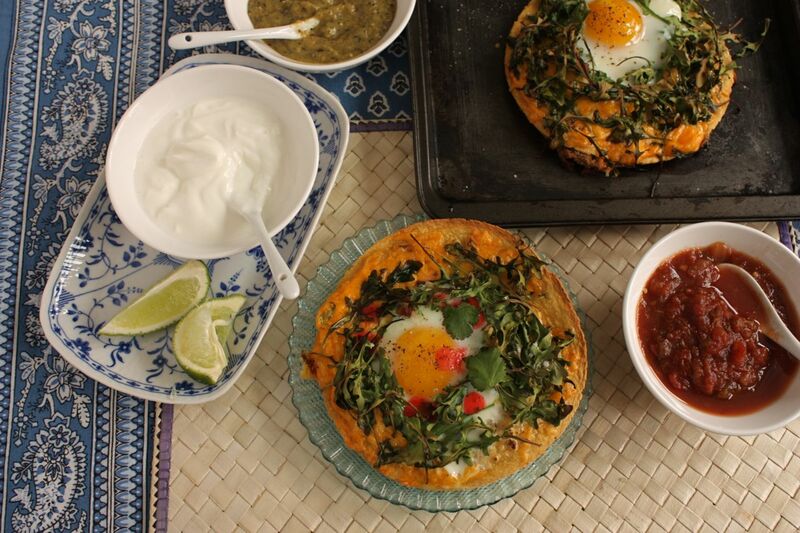 Baked = lots of eggs can cook at one time = huevos rancheros is now an option for that brunch you’re hosting. Or = you get to eat too much huevos rancheros. Overeating eggs + guac = best. We agree. Note: You can make the beans the night before and refrigerate. Allow them to come to room temperature before proceeding. This recipe doubles well. Preheat oven to 400F degrees. Heat oil in a skillet over medium high heat. Add shallots and cook until softened. Add beans and oregano, season with salt and pepper and cook for 10 minutes, stirring occasionally. Remove from heat, mash mixture roughly or transfer to a food processor and puree for a smoother mixture. Place 4 tortillas on a baking sheet, top with a quarter of the bean mixture and cover with remaining tortilla. Add 1/4 cup of arugula to the top of each and create a nest with a large hole in the centre. Crack 1 egg into each hole and bake in oven for 15 minutes or until the whites are set. Serve with a dollop of guacamole, salsa, hot sauce and greens and limes.